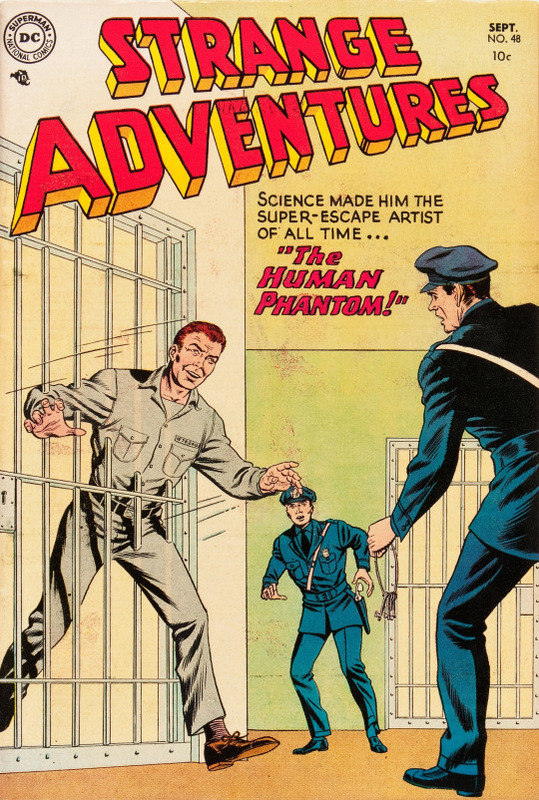 After turning to a life of crime, his boots are blown off in an explosion and it spells doom for our “negative man”. Don’t think about it too hard or you’ll wonder why he was able to wear boots in the first place. Or, more importantly, how a “positive matter” pump could bring “negative matter” water to the surface. A little kid named Lenny is found to be a super genius but only for the duration of a solar eclipse (roughly three minutes, hence the title). The rest of the time he’s just an ordinary boy from rural Nebraska. When a seismologist discovers a distant geological upheaval will soon threaten a large part of the earth, it’s decided only a genius like solar-eclipse-influenced Lenny could parse the incomplete available data and figure out which part of the world is in danger. In a race against time, Lenny and the pertinent information are flown to the other side of the world where a solar eclipse is happening. Lenny makes it to the eclipse just before it’s too late and figures out that a disturbance at the the South Pole will cause a giant tidal wave to head towards Australia. All the coastal cities are evacuated avoiding widespread disaster. During the eclipse, Lenny also writes down an “explanation” of his strange powers, although none of it makes sense to him once the eclipse is over. What? Leonardo Da Vinci? The eclipse must have ended because I don’t understand any of this. Galen Barnes checks out some movies from the library and they all turn out to be “How To” films from 100 years in the future. Strangely, film technology has not advanced in the least and these movies play just fine on his little home projector. Barnes continues to borrow these motion pictures from the future and he and his wife use what they learn in the films to build all kinds of advanced machinery. Then one day, a hydrogen bomb test threatens to bring disaster to the west coast. Barnes consults a film on radioactivity to see if it offers a solution to the problem. Following the instructions in the movie, he is able to build a machine that nullifies the radiation and saves the day. 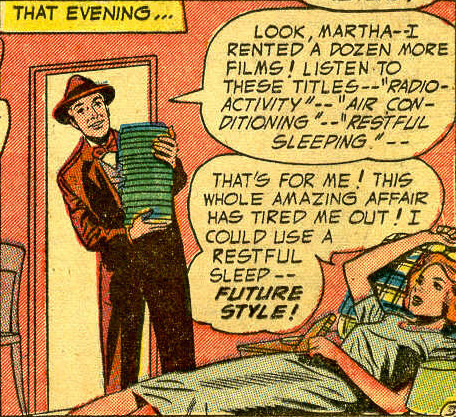 Later, we find out the radiation movie’s solution wouldn’t have worked at all if Barnes had followed it correctly. 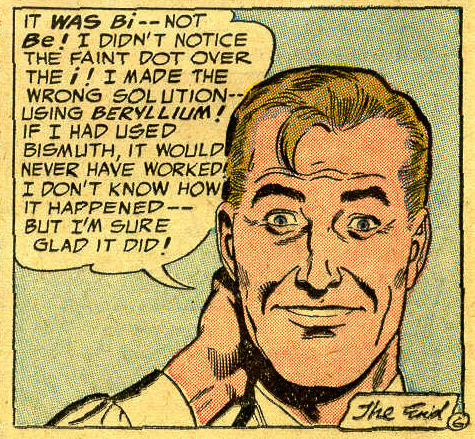 He accidentally substituted the element beryllium for bismuth because of their similar symbols. Not sure why that twist was added at the end. Maybe the script was a page short. 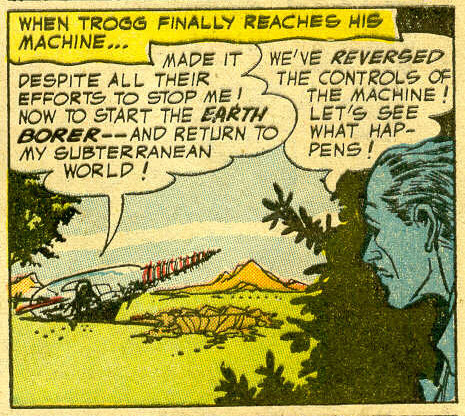 Trogg, a man from a from a race of people with no eyes living deep within the earth, has bored his way to the surface in a giant machine. While among the “surface people” he gathers information to help the underground populace with their plans of invasion. Ready to return to his subterranean civilization, he heads back to his “earth borer”—the only one the “mole people” have, naturally. For no explained reason, the authorities are in hot pursuit and have set up roadblocks to try and keep Trogg from his destination. When Darwin Jones of the Department of Scientific Investigation arrives at the earth borer ahead of Trogg, he “reverses the controls”. The fact that it was created by an alien culture, he doesn’t know what it’s for, and it’s the first one he’s seen, are just trivial obstacles. When Trogg reaches the borer and tries to return home, instead of burrowing into the earth, it flies up in the air and explodes. Though the invasion has essentially been stopped, the authorities still have no idea who Trogg was, where he came from, or what his purpose was. Which just goes to show you, if you see someone unusual and you don’t know what they’re up to—kill them. Did Donald Trump write this? and may not be used without the permission of Craig Bostick. All rights reserved.